As usual this month too I was not able to finish baking partner’s challenge on time. Yes the reveal date was 15, I was sick with strep throat and fever. Now that I have recovered, I decided to finish the challenge. This month challenge was suggested by Marisa of Thermofan. She asked us to make Empanada gallega/ Galician empanada. I decide to make vegetarian version of Empanada. This empanada gallega is different from Mexican empanadas they are like hand pie. I want to make them too. 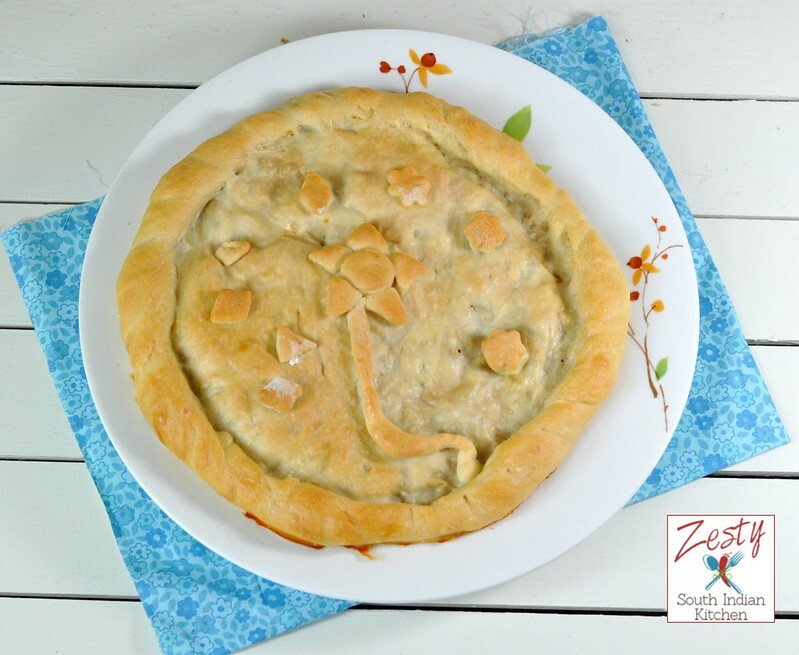 However this Emapanda gallega is full form pie with cover made of bread dough and filling made of either vegetables or fish or sea food. Galicia is an autonomous Community located in the in the northwest of Spain, right on top of Portugal. The Galician empanada is the signature of Galician cuisine. Empanadas first appeared in medieval Iberia during the time of the Moorish invasions. The name comes from the Galician, Portuguese and Spanish verb “empanar”, meaning to wrap or coat in bread. Nowadays it is a common dish all over Spain. The dough is thin and made with wheat or corn flour, not cornstarch (similar or the same used for making bread). It’s usually prepared with the fillings you can imagine: fish, seafood, veggies or meat and a mixture or vegetables called “zaragallada”. It can also be baked with sweet fillings. It’s delicious. Empanadas can be served as an appetizer, first course or “tapa”; freshly cooked or cold but are best at room temperature. I decided to follow the cover recipe as such however, made changes in filling. I have universal vegetable filling, which I use for my samosa, vegetable hand pie, cutlet etc. So my Empanada gallega is fusion between Spanish and Indian cuisine. Their marriage turned out to be excellent. Spicy filling with potato, onion, green and red bell pepper turned out be delicious. Day before baking Empanda Gallega I made filling and then dough for the pie on the next day. Once I made more pie dough and filling, then the dreaded part came, yes empanda gallega is an artistic master piece, out cover is topped with beautiful designs made with bread dough. With two little ones constantly pulling my dough from both sides, making design was another difficult task. Still I managed to make some before my dough got vanished. Once baked, hubby wanted to eat it immediately, however food blogger in me prevent him from doing that. Yes I commit that sin most of time by telling him photo first and then eating. Poor guy told me you are cooking for blog not for us. I like to take that blame rather than missing my photography section. Finally after the photography, I gave him the slice. He told me it is excellent. I am happy that entire pie was finished in one sitting. As cook what else do I need? 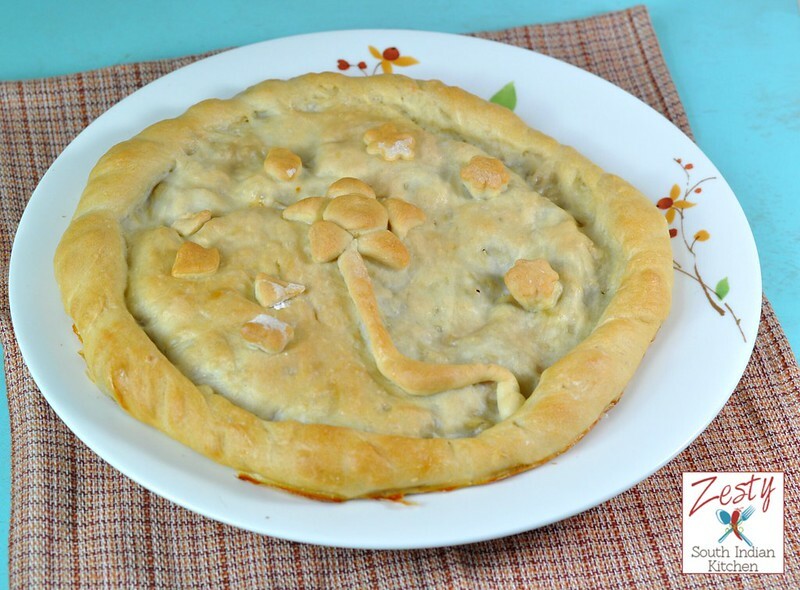 Here comes my recipe of Empanada gallega. Give it try you will like it, please make sure to look at other baking partners creations too. 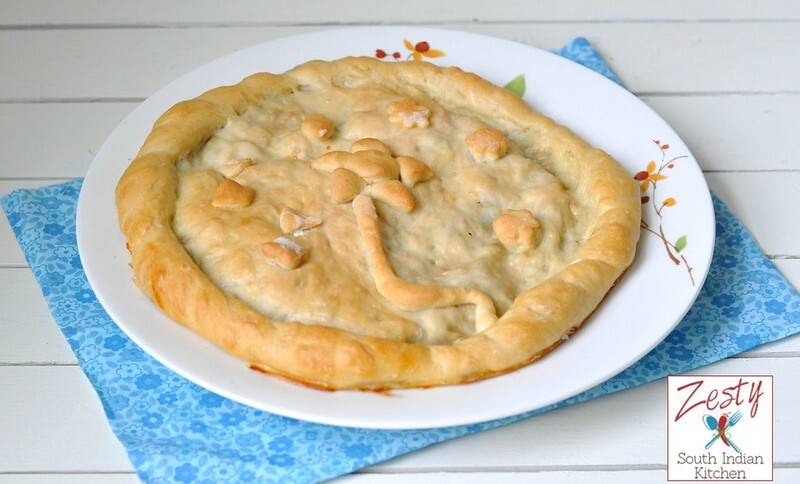 Delicious bread based pie with spicy vegetable filling. In a kitchen aid stand mixer bowl add flour, salt, yeast, oil and water to form sticky but soft and elastic dough. Transfer the dough into lightly greased bowl with a plastic wrap and let the dough ferment for about 60 minutes or until doubled in size (depending on ambient temperature). To verify that the dough has risen, pressed with a fingertip. When the process is complete, the mark made with the finger gradually disappear. If the dough has not finished fermenting, the mark will disappear immediately. If has grown to excess your finger will leave a permanent mark. Boil and peel the skin from boiled potato and mashes into small pieces. add onion fry them until it become translucent or change color it take about 6 minutes. Then add all the chopped vegetables and cook for another 6 minutes. To this add ginger-garlic paste and fry for another 3 minutes. Then add chili powder , salt and garam masala stir well and let them cook until the vegetables are tender and cooked well. Then add cooked mashed potato and mix everything well. Finally add1 teaspoon lemon juice and chopped coriander leaves and mix well. Switch off the flame and keep aside. When the dough is fermented completely, gently press on the dough to degas and remove it to a lightly-floured work surface.Divide dough in half. Roll out one half of dough really thin (cover the other half with a napkin to prevent drying) and make a circle (the size of a dinner plate) if possible and place it on the baking paper. If the dough shrinks wait 10 minutes to relax and stretch again,like it very thin. You can use a piece of baking paper or a silpat to transfer the dough to the counter (or baking tray), it will make it easier to move the dough around. Roll out the remaining dough (slightly smaller than the base) and gently transfer it over the filling. Using your fingers pinch edges to seal. You can also do this with a fork or a cutter. Watchthis video to see how it is done. Pre heat the oven at 180 ºC / 350°F. Dear friend, as I’ve told you in facebook, I’m glad you and your family have liked our empanada gallega. Your children have played wiht the leftover dough and have had fun which is very nice and your husband was wiiling to eat it. Congrats because is beautiful and is just the first one. My friend Milia is happy and me too. Looks very delicious dear..loved the filling as well..And the way its decorated with the dough is so cute..
I’ve eaten empanadas years ago and loved it!! very well done and loved the twist in filling and cute decoartions..yummy! Una empanada fantástica, con un toque picante delicioso. Pie looks super yummy!! Very filling too!! Now that’s an empanada!!! 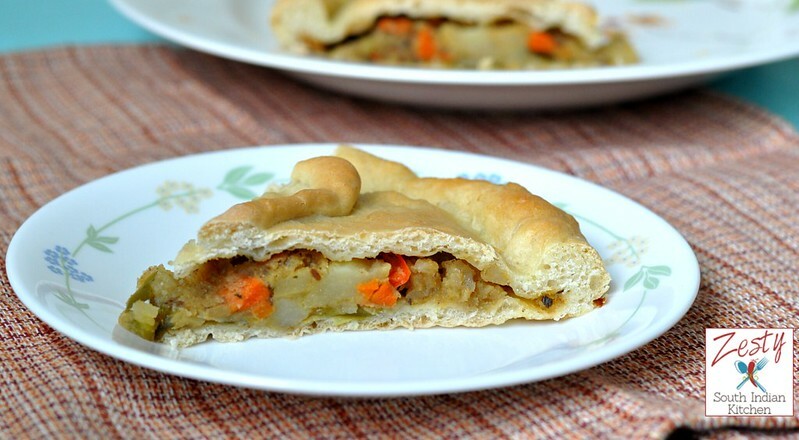 A bunch of vegetables stuffed between two pastry doughs – how can noe go wrong with that. Scrumptious! Ateus is my famíly fav snack vch is popular in foz vth sum changes n diferent fillings.nice step wise images n yummy filling..